In aeronautics, canard (French for duck) is an airframe configuration of fixed-wing aircraft in which the tailplane is ahead of the main lifting surfaces, rather than behind them as in conventional aircraft, or when there is an additional small set of wings in front of the main lifting surface. More updates to come - Suggestions/Comments/Critique/etc. are welcome. most ultralights that i have seen expose the pilot and engine to the elements. your weight specs might be close, with human (200 lbs) plus engine (178 lbs) and gas (15 gallons at about 87 lbs) that gives you about 970 lbs to work with. This aircraft is 430kg including a 120hp Jabiru engine and pilot. So with this in mind perhaps I have over calculated the weight of the aircraft those Australian law specifies that - for an aircraft to be classified as an ultralight- it has to be a maximum weight of 650kg. Anyway I am yet to do more specific calculations. I certainly haven’t done the calculations, but just eyeballing the design it seems like you need a bit more lifting surface on the wings, like maybe 25% to 33% more? It’s a very cool looking design. Accuracy of design aspects - for if concept model was to be then reproduced into a plan or prototype. Alluminum might be too heavy to use it for UL aircraft. Modern planes are made from composites, which are lighter, stronger, can be formed to more extravagant shapes than metals. So I`d chosen composites instead of alluminium. Of course, there are small canard aircraft flying, but not much. This concept might be aerodynamically unstable in some cases. I think, most aircraft have center of gravity in front of the point, where lift is generated, therefore the elevators have negative lift. But on canard aircraft both the main wing surface and the canards generate lift, so the wing surface might be smaller (or weight load of wings lower), which helps to minimize the dimensions. I seems that the lenght of your design is not sufficent to provide enought stability. On the other hand, it looks different and unusal. This is the part of design, where experts at aerodynamics can help, not me. The aircraft fuselage does`t look sleek to me, now. I seems “fat”, maybe prolonging the fuselege will help. Very nice modelling job! Practically speaking, I think you should have the front wheel to avoid burrowing the propeller on landing should you pitch forward. Thanks for all the replies people, muchly appreciated. Yes I have been looking at those wings… they do seem a bit slim for what they are trying to support - or perhaps too fragile looking I am not sure. I’ll mess around with the wing widths a bit and see how it turns out. Yes - don’t worry - I totally understand blender is not the tool for developing plans or complete accurate designs of aircraft but thats not exactly what I am after here… what I am using it for is as a sort of … “this is what I am thinking tool”… so I may be halfway through describing this ultra awesome plane concept (perhaps not ultra - :p) and then I will show them this picture and they will be like: “Hey! Thats what hes thinking!” but on perhaps a more serious level. If it were to be used in a pipeline for developing plans for a new type of aircraft I suppose this would be right at the start where the designer gets that bright idea but needs a media to give everyone else his bright idea to get some feedback before going serious. Hmmm… after some thought that I should have thought about some time ago I would have to agree with you one this one… though what about price (not that it is really important in this case), aluminum would be cheaper. Anyway I’ve chucked it into the To Research pile and will look into it a bit deeper later on. Thanks for bringing it up. Something about the canard design when trying to scale it down to ultralight size is that it is hard to make it work like the normal larger designs - one example of this is my current design if made real wouldn’t sit on the ground but tip backwards because the weight of the engine being in the back and nothing to counter it at the front of the aircraft which is a pain… this has been dealt with in real life by simply folding up the front wheel so that its nose rests on the ground which is something I want to avoid in my design. Possibilities for countering it is either having a baggage compartment in the front nose area though thats not really an option because this aircrafts intentions are for sport and not everyone has heavy luggage to take with them when flying - another option is to have an actual counter weight on the nose or built into the front wheel or even nose wings though I am not sure on how that would effect flying. As for the length… fat looks cool… long doesn’t… thats what it comes down too! No… I am trying to work it out… give me some time and I’ll see what I can come up with. Fuselage doesn’t look sleek!.. :eyebrowlift2: Well it looks sleek in comparison to the other UL Canards that I have seen. Thanks for your comments… most constructive and helpful. Practically speaking, I think you should have the front wheel to avoid burrowing the propeller on landing should you pitch forward. Sorry? The only way this plane will be ditch is backwards which is highly likely due to its current state of weight balance as explained above. Thanks all for you comments they have been most helpful! And now here is a small update of some quick work I have done on the cockpit… just added some seats and the instrument panel… oh and I forgot to mention I believe I can squeeze two people into this thing… what do you think? And I do see how that wing sort of “detaches” from the fuselage near the engine… i’ll endeavour to fix it up next time. I would actually make that “detachment” of the wing from the fuselage a design feature. You will need to remove the cowling around the engine to service the engine, less work if you don’t also have to dismount part of the wing, too. sorry, yes, i meant backwards (forgot it was a pusher). As in, if you abort a landing and go nose up, or even just bounce on a landing, your nose goes skyward, which means your aft drops and the prop (rear of the wings which are the axis) drops lower and digs in. It was a common problem on the early tail draggers, and your design has the same issue (but in reverse). So, I would suggest a single rear wheel to stop that. Also, to second the nay-say regarding a canard on such a short body - when flying along, a single wing provides a single lift and maneuving, resulting in a ride like a horse. With the canard providing such a lift/directional at such a moment (like a lever acting using the wings as a fulcrum), it will make the plane pitch very acutely, resulting in quite a wavy ride, and loss of control if nothing is there to dampen it. Example: Plane pitches forward, you pull up, the canard causes you to oversteer and the plane goes noes up. You push down, again oversteer, and now the plane is pitched forward even more. This oscillating results in either a nose up stall or a face plant orientation, all happening within about two seconds. my father and i would go out an ultralight school and watch them fly around it was fun. instead of using Aluminum, you may want to look into glass-reinforced plastic (fiber glass) or carbon fiber reinforced plastic (expensive). was poking around in wiki about ultralights and found Rutan VariEze, which looks similar to your design, but it doesn’t have the 3 wheels like yours. Well, lift isnt function of only wing area. Thin and long wing generate more lift than wing with long chord at speeds at which UL planes fly. Maybe if you want more wing area, try to make those winglets or vertical stabilizers at another angle, so they will act as V-tail, used as both vertical and horizontal stabilizers. Still, when I look at the plane I think the wing doesnt belong to the fuselage, from the designers view. The fuselage is big, and the wing qiute slim at the tips. I dont know what profile you have chosen for the wing, but the roots might be a bit thicker. Why are the ailerons so long? 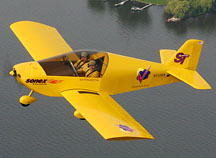 It will be used for aerobatics, too? That small gap on the trailing edge is nice, I like it. At least, make some swept, distorted and crazy propeller. The most modern designs are awesome. Like these: http://en.wikipedia.org/wiki/Image:Hercules.propeller.arp.jpg Now it looks to big, and surely it would touch the ground. If I understand correctly, this is not that bad. The maximum angle the elevators will rotate can be small, so no wavy ride will occur. And we don`t know, where is the centre of gravity, or the aerodynamic center. OK, now to the mesh. The model as whole is nice, but details are now poorly defined. Using creases with subdivsion is simple, or try to separate the mesh into more pieces. The holes in engine part vague (I don`t know if this is intention) and the cocpit frame strangely blends into aircraft surface in some places. I will be great to see perspective wires and ortho wires of side on top view. Now, it seem that there are some triangles in engine area. Also the wing doesn`t blend into fuselage. Just quickly before I have to go to work I am giving you some side, front a top views of the mesh of the aircraft. Now I use Subsurf quite heavily here but I have turned on optimal draw for the fuselage to hopefully help matters. I’ll read all your comments in detail when I get back but in the mean time… I gotta go! Rightio… lots of reworking going on here - I reviewed the design and tried to work out something that would manage the weight of the engine in the back half of the aircraft properly so that the plane would sit nicely on its three wheels. First thing was to stretch out the fuselage and then bring the back two wheels back a bit and the cockpit forward. Also the wings were re-done to be a bit more think so that they suite the rest of the aircraft (like Myn.pheos mentioned). I am not sure how quickly I can continue working on this project as the TankWarz project (see signature) is nearing the next demo release phase (late this week hopefully) and all concentration is going towards that – though that doesn’t mean this project is dead. Keep hurling comments, critique and what not because it is all very helpful. Great model and renders. How do you get such hard shadows with AO? It looks really good, like its in direct sunlight. Are you going to do textures? Nice change. The plane now looks faster and more stable. Youre doing very well! That new version would have propably better aerodynamic characteristics, because it is longer. Also longer and thinner fuselages tend to have lower drag than short and wide, therefore the aircraft is more economical and has better performance. Have you already decided where will be the service panels on surface to allow acces to internals like engine, baggage compartement? If not, then make it now, and prepare the mesh, adjust vertices to copy them. It will save you a lot of time, if you doo it now (hope it isnt too late yet…). I can see some bad topology, which could be turned into design feature. In picture wipplane17.jpg there is a line going from the front of cocpit, then above the wing and it dissapears in the aft. Make that line a bit sharper and more defined, it will surely look good. I advise you to make a “test pilot”, a simple boxy figurine of human proportions just to see if it fits into the cocpit (I doubt it will fit now, the cocpit seems tiny compared to engine, from the side view… ). The cocpit is too shallow, for such a small plane the floor should be almost at bottom of fuselage. The engine is air cooled, am I right? If so, then it needs a lot of cold air. Prepare the rear parts by adding addional loopcuts for air intakes. The rear wheels are smaller than the front one, if you like it, keep it so. I don`t know, what kind of suspension is on the main wheels, the lightest is one support for each wheel, which can elastically bend to absorb forces when landing or taxiing on grass. The wing looks much stronger now. Althought F-104 had its wing only 8 cm thick, this aircraft needs a bit thicker lift surface. It won`t cruise at supersonic speed, so find a nice profile for it. Now it looks very flat, and most UL aircraft have low speed wing profiles, which have the upper side formed in arc. The current wing fits for jet fighter. Only the wings of aerobatic planes have the dihedral angle of 0 deg, as far as I know. Positive angles (when tip is higher than root) are most widely used, because those are more stabile and therefore safer. You may want to make it cranked, just for visual appearance. Similarly, wing`s the angle af attack is usually greater than 0. Oh, and thje lightning is nice, like it, this is very nice.